Social Media Optimization (SMO) is the method of Social Activity that attracts visitors to a Website through an Elevated Search Rank. It proves there is a science to Social Media just like Search Engine Optimization (SEO), the process of maximizing visitors to a Website by achieving a Top Rank on Search Engines around specific Keywords. Both work hand in glove. We all are Social Beings. And what's better way than to reach out to consumers than on Social Platforms where they spend most of their online time. We address this young but powerful arm of future marketing with intuitive and specially tailored Social Media Marketing solutions for your Brand. As a business in the Internet Age, you can’t exist without addressing the critical issues of Online Visibility and Customer Interaction. That’s exactly what SMO is designed to do. In today’s world, Social Media is an indispensable tool for any Brand or Service. Social Media Optimization (SMO) was originally designed to drive Traffic from Social Media Sites such as Bookmarking Sites and Social Networks. Good SMO will drive Traffic from both Direct Social Site referrals and from Search Engines. But there is a fundamental difference. SEO is based on Keywords; SMO on Contents (Words, Videos, Images). When integrated, they are a Brand’s most powerful combination for Raising Visibility and Generating Businesson the Web. Social Networks, Blogs, Professional Networks, Forums and Online Communities such as Video and Photo-Sharing Websites can do wonders for a Brand trying to establish a Direct Connection with its Customers. 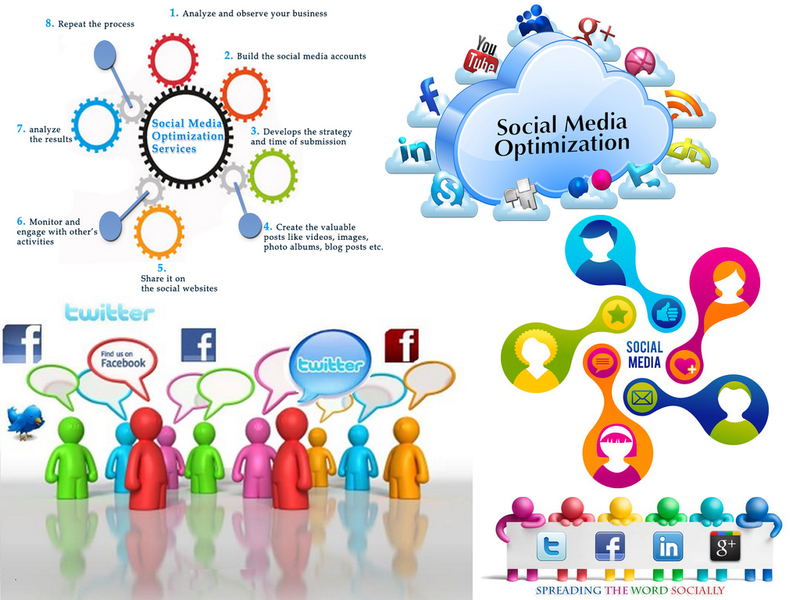 ADVANTAGES OF SOCIAL MEDIA OPTIMIZATION. Helps create Brand Awareness in the Social Networks. Drives good quality Traffic to your Website from SocialNetworking Websites. Assists in Boosting Link Popularity and gaining Non-Reciprocal Links. Enhanced Web Traffic – Social Media Marketing if done in a proficient manner can generate immense Traffic for your Brand. Branding - Social Media Marketing Services can be a great resource for generating Brand Awareness. Reputation Management –With the help of K3 Web Creation, One Of The Leading Social Media Marketing in Mumbai, India you are able to know what others are saying about your Brand and manage your Online Reputation Effectively. WHAT IS SOCIAL MEDIA OPTIMIZATION? EXPERT’S QUOTES! "SMO is similar to Search Engine Optimization in that the goal is to generate Traffic and awareness for a Website. In general, Social Media Optimization refers to Optimizing a Website and it’s Content in terms of sharing across Social Media and Networking Sites." "Social Media Optimization is becoming increasingly important for Search Engine Optimization, as Search Engines are increasingly utilizing the recommendations of users of Social Networks such as Facebook, Twitter, and Google+ to rank pages in the Search Engine Result Pages." 12 TIPS TO MAKE IT HAPPEN! 1. Reputation - build yourReputation as a reliable qualified source. Undertaking thorough Research and Producing Original Content or Curating Quality Content. This will make you a respected and qualified source. 2. Engagement - Encourage more engagement, sharing & reciprocate. You need to actively Engage with your audience. This can include Commenting, Mentions, Shares, Likes, and Plus Ones. No one is as smart as everyone so share other peoples' Content and provide a good user experience by providing Feedback and Comments. You need to target the networks with which to interact and make it easy for people to interact such as Google+ Communities, LinkedIn Groups, Blog. 3. Authority - become a notable authority in your field of expertise. There are many aspects to Authority. Search Enginesare interested in ascertaining what Individuals and Brands are seen as authoritative and trusted by real people on the Internet. You can also enhance your Authority and the Value of Content through Social proof. In essence the more your Content is shared through Plus Ones, Retweets, Bookmarks or Likes the more it indicates the value and usefulness of your Content. It may also encourage others to read your Content. 4. Leadership - harness originality & creativity, be a Thought Leader. Leadership is about High Quality Research, thinking and Original Content Production. A leader will research everything they can about their areas and share thoughtful insights which will Add Value to your audience. As a Leader you can also Create Value for your audience through Content. This means Adding Value to Content by providing a Summary, adding Context or a Perspective to the Content you are sharing. 5. Social - be Social, find and engage sociable experts in your field. 6. Media - know your Social Media platforms to maximize influence. It is important you focus on the right Platforms and Communities. Where does your audience hang out? Find and focus on the Platforms, Communities and Groups where your audience hangs out. Some Platforms are far more effective in improving the SEO benefits of SMO than others. The most effective Platform is Google Plus. The research shows that Google is counting all activity from all Google+ Posts back to the Original Blog Post. 7. Optimization - improve technical aspects to increase optimization. Some Practical and Technical Aspects of Optimizing SMO. Share Buttons - Make it easy to share for users by adding Share Buttons to your Content. You should also show the numbers of shares to demonstrate Social proof. Social Icons - Group and display your Social Icons in a prominent place on your site. Subscription Options - Group together Subscription Options such as Email, RSS, and Newsletters. Shareable content - Some Content is more readily shareable such as 5 Top Tips articles as they are short and scanable. Social Login - Use Social Login Options to make it easy for users to Comment. Title Tags - Optimize your Title Tags for sharing, especially on Twitter where there is a character limit and include your name. Images - They really do say more than a thousand words. Include Images that Add Value and include an Image that can be used as a Thumbnail for your Content. 5 RULES OF SMO FOR YOUR WEBSITE. Increase your link ability – This is the first and most important priority for Websites. Many sites are "Static" – meaning they are rarely updated and used simply for a storefront. To Optimize a Site for Social Media, we need to increase the Link ability of the Content. Adding a Blog, Creating White Papers and Thought Pieces are also great steps. Make Tagging and Bookmarking easy – Adding Content features like Quick Buttons to make the process of Tagging Pages easier, but we go beyond this, making sure pages include a list of relevant Tags, suggested Notes for a Link (which come up automatically when you go to tag a site), and making sure to Tag our pages first on Popular Social Bookmarking Sites (including more than just the homepage). Reward Inbound Links – Often used as a barometer for Success of a Blog (as well as a Website), Inbound Links are Paramount. Help your Content Travel – Unlike much of SEO,SMO is not just about Making Changes to a Site. When you have Content that can be Portable (such as PDFs, Video Files and Audio Files), submitting them to relevant Sites will help your Content Travel further, and ultimately drive Links back to your Site. Encourage the mashup –YouTube's idea of providing Code to cut and paste so you can imbed Videos from their Site has fueled their growth. Syndicating your Content through RSS also makes it easy for others to create mashups that can drive Traffic or augment your Content. As A Social Media Agency in Mumbai, India, we at K3 Web Creation, help businesses like you to reach out to many more potential clients and enter those business regions. As you know this space too is overcrowded with many Platforms competing with each other, so it becomes the duty of a Social Media Agency in Mumbai, India like us to determine which services would best suit you. Being A Professional SMO Company in Mumbai, India, we at K3 Web Creation, also amass all the various Networking Tools to help devise a strategy for you, such as Videos, Podcasts, Text Messages, Blogging, Facebook, Twitter, Google and YouTube, etc. We also do our best to develop New and Innovative Strategies to lead clients to achieve more and better. As part of our Professional Social Media Marketing Services array, we also help our clients draw more Traffic to their Sites so that they get new clients and increase their revenue. We at K3 Web Creation, which is a force to reckon with in terms of Social Media Optimization Company in Mumbai, India, try to envisage on ideas and strategies which fetch profit and benefit to your line of business. We also guarantee that we will manage your site's User Engagement. We will bring upon Social Media Initiatives and Promotions to drive Digital Marketing and fetch crowd and user Traffic. As A Premier Social Media Optimization Company, we create and fine tune an advanced action plan of Social Media Strategy which in turn helps us identify with the best features of one's business. K3 Web Creation understands your company identity impacts your bottom line. A positive company and product identity enhances your sales and your entire Marketing Communications Plan. A STRONG COMPANY like us can Enhance, Create, and Project an Image that will help you sell your Product or Service.